Dark Scary Places | Redeemed! I absolutely love spending time with our horses learning horsemanship! I’m still not much of a horseman, but am constantly learning. I’m at a stage now where I get a big kick out of small changes. Sometimes it’s a small improvement in an area we’ve worked on…other times it’s a problem that crops up and is handled using newly learned tools. Last night, I trailered three of our horses to the farrier for hoof trims and shoeing. All three horses are accustomed to trailers and load very easily…until last night. For some reason, when loading to leave the farrier, each horse hesitated at the trailer door refusing to go in. I’m not sure why…maybe the unusually bright moonlight made the trailer interior look darker and therefore scarier. Whatever the reason, each horse balked at the trailer door, and no amount of coaxing could persuade them to step inside. If this had happened two years ago, I would not have known what to do. Facing the same event two years ago, I would probably have tugged and pulled trying to force the horse into the trailer while asking someone else to apply pressure from the back end. And who knows…I might fall into that same pattern next week…this horsemanship gig is a tortuous journey full of surprising twists and turns for both me and the horses. It’s a lot like parenting. Last night, though, was different. Last night, when the first horse refused to load I realized this was neither about lack of understanding nor lack of willingness. It wasn’t even about loading or not loading. In fact, it wasn’t really even about the trailer. The issue to be addressed was lack of confidence. For whatever reason, that particular horse on that particular evening was not confident about loading in that dark scary-looking trailer. His confidence had been replaced with fear…and it was up to me to regain his confidence. His fear was rooted in the trailer and his lack of confidence was rooted in self. It had nothing to do with me, really. He was not afraid of me, nor was he challenging me. He lacked confidence in himself out of fear of the scary-looking trailer. The solution, however, had nothing to do with the trailer and everything to do with me. I needed to get his focus off the trailer and onto me. I needed to boost his confidence in me. His lack of self-confidence needed to be replaced with confidence in me. We took a few steps away from the trailer and spent about two minutes doing a few basic exercises: step back, step forward, right shoulder turn, right hind-quarter turn, left shoulder turn, left hind-quarter turn, back two steps, forward two steps, back one step, forward one step. Then I led him into the trailer. No fuss, no bother, no fear…just confidently following me into the trailer to stand quietly while I closed the stall separator. Then I did the exact same thing with the other two horses, with the same results. I love when things work out so well. More importantly, I love when I am able to read a situation well enough to know the solution. And I love knowing my horses have enough confidence in me to follow my lead. This morning I realized there are a few life lessons in last night’s events. Lesson 1: When I am scared, the issue is whatever I fear combined with lack of confidence. The solution is to move my focus off what I fear and onto Jesus. With my focus on Jesus, lack of self-confidence is replaced by confidence in Him. Lesson 2: Placing my focus and confidence in Jesus is best accomplished by simply obeying Him in small things…by following His lead in little things that have nothing to do with the big scary thing. How does that play out in real life? Lots of ways, but let’s take one current event. I think most of us are a little (or a lot) concerned about what’s going on politically in the United States, right now. Whomever any of us may have voted for and whatever outcome we hoped for, right now we have a lot of uncertainty as to how exactly things will pan out post-election. There are a lot of unknowns, and it is natural to fear the unknown (just as it is natural for a horse to fear a dark trailer interior). The solution is to move my focus off the uncertainties and onto Jesus. I do that by spending time alone with Him and by following His command to “Love one another.” I do that in daily little things…by treating others with love, respect, and understanding. As I follow Christ’s lead in these little daily things, my confidence in Him builds and my fear of uncertainty is replaced by confidence in Him. 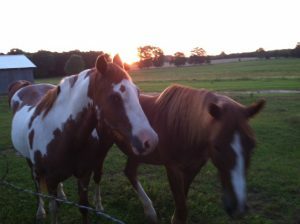 This entry was posted in Animal Stories, Faith, Horses, love and tagged christ, confidence, faith, fear, horsemanship, horses, love, self-confidence, trailer loading, trust by joe. Bookmark the permalink.